As someone who’s drawn, and built from his own plans I don’t find myself asking this question all that often, but I understand why others might not find it as easy to accomplish as I do. Thankfully there are a lot of resources filled with furniture and project plans. Books, DVDs, magazines and online resources. Unfortunately, not all of them (especially certain ones online) are legitimate. 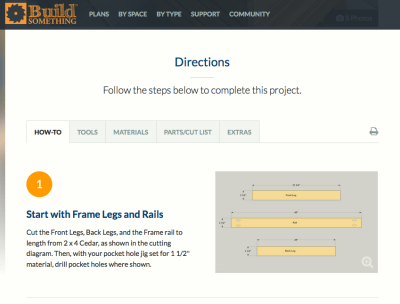 A new resource to checkout for project plans and instructions is the website www.buildsomething.com. 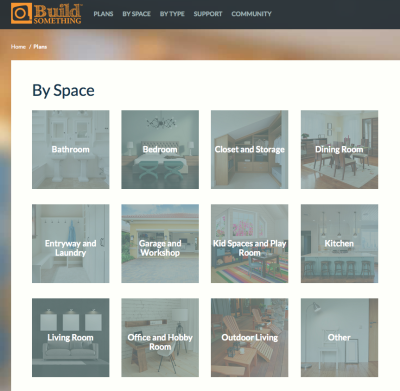 Over at BuildSomething.com they have a very easy to navigate website which makes it quick and easy for visitors to find project plans and inspiration for their next build. Sort for plans by the space they’re needed for! Navigating the website is super simple. The folks at BuildSomething.com took the time to categorize the projects by the specific type (e.g. “bed,” “built in cabinets,” etc.,) and even by the space the project will occupy (e.g. “bedroom,” “kitchen,” etc.,) and even by popularity. BuildSomething.com is very much a community-based website, so if you decide to signup (for free) you can leave comments and join in discussions on projects, but it’s not required to take advantage of the great project plans. If you’re looking for a plan for an upcoming project, or have a plan you’d like to share, visit www.buildsomething.com to get started.